and won’t break your gardening budget? You know how we feel about watering…. Consistent attention, right? While that will always be true, especially in the spring and summer, installing an adequate layer of mulch on the soil in your garden will help your plants retain water. That means you won’t have to water as often, saving you time and money on those water bills down the road. What do we mean by adequate? Here’s the rule of thumb: A mulch cover of 2-3” gives you a nice barrier against water evaporation, aids in weed control and eventually decomposes, supplying nutrients to the soil. More than the recommended depth, and you could be asking for trouble. For instance, if you pile it on top of plants or too deeply, it can cause plants to rot. As we said, a good cover of mulch not only quenches a plant’s thirst, it feeds it, too. As the wood fibers, leaf materials and other mulch matter decompose, they seep slowly into the soil and provide nutrients your plants need for growth. They also feed tiny microbes and insects that will work the soil and (get this) chew away on tiny weeds so you don’t have to. This decomposition happens in much the same way it happens in the forest, where leaves, bark and needles carpet the forest floor and provide food. Have you ever noticed that people who live in the Midwest are fixated on the weather? There’s a good reason for that. It never stays the same, even for one week, and it is nearly unpredictable, despite the best efforts of local meteorologists. Here in St. Louis, MO, we are susceptible to late frosts in the spring, heat waves near the end of fall and just about everything in between. Mulch is the knight in shining armor, an armor of organic matter that regulates temperatures, acting as a cozy blanket when temperatures suddenly drop to 30 degrees at the end of April or as a wet cloth on the forehead as temps climb above 90 in October. While it doesn’t always win the weather battle, mulch’s scorecard is pretty impressive. Your layer of mulch also keeps light out, and in this way, mulch stops the growth of weeds that need that light to germinate. It’s important to recognize that Mother Nature provides weeds, not to frustrate gardeners, but to fill an empty canvas with something leafy. By minimizing bare soil in your garden, Mother Nature doesn’t feel the need to fill everything in. A whimsical explanation, maybe, but this is essentially how it works. There’s one caveat here. Some mulches may actually harbor weed seeds, as well as rocks and other undesirable debris. It’s always best to get your mulch from a place you trust. In the same way mulch holds in moisture and heat, it also serves as an erosion control. 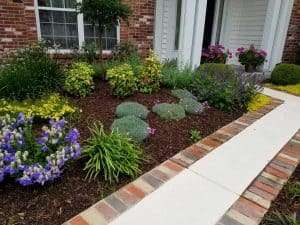 If your flowerbeds are on a hillside, for example, a healthy layer of mulch will help them from washing away during spring rains. Think about seeding a lawn – there’s always a layer of straw that goes down on newly sown seed. That’s to make sure everything stays in place until the seeds have a chance to germinate and take hold on their own. Mulches come in a variety of textures and colors. 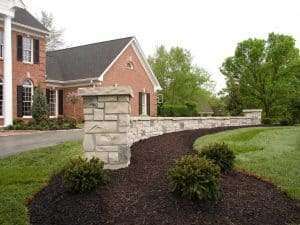 A dark brown mulch will add contrast to light colored brick and stucco. Further, mulch keeps everything looking tidy and creates defined spaces. Think about a room in your house that is strewn with clutter and then consider the room when everything is picked up and in its proper place. Visually, mulch helps you achieve that ordered, neat look outside. Be careful when applying mulch as perennials first begin to emerge so you do not smother or break the new growth. It is often easiest to mulch before perennials come out. Likewise, if we are nearing fall, add mulch before the first blast of frost and snow so that there’s a blanket of warmth to keep it from freezing deeply. We do not recommend installing weed fabric under mulch. As the mulch breaks down it creates a layer of soil which weeds will love. Over the years the soil layer will become deeper and eventually start to choke out the plants and need to be pulled off. It is best to install quality mulch directly over the soil at a 2-3” thickness. Pre-emergent herbicides can also be used to reduce weed germination. We do recommend using weed fabric under all decorative gravels to prevent gravels from mixing in with the soils. At Passiglias, we offer several different varieties of mulch, and we can help you match the right mulch for your specific garden needs. 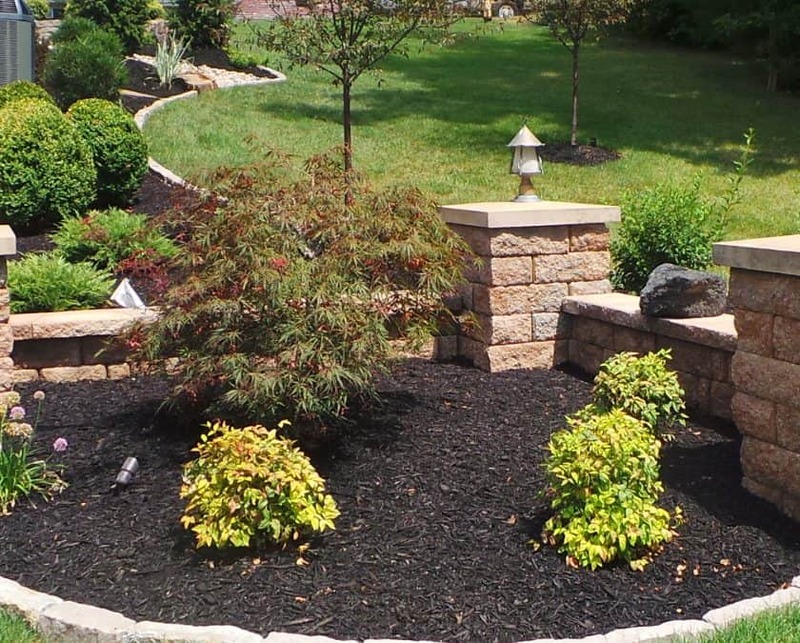 But, depending on your approach to the overall environment, here are some things to consider: Hardwood mulches such as shredded bark mulch or Brown Dyed Mulch are eco-friendly and help nourish your soil. Hardwood mulch is readily available because it is often a by-product of timber harvesting or landscape maintenance, so no new trees are destroyed in its preparation. While cypress is a popular mulch, it has a big cost to the environment.The timber industry clear cuts cypress forest at a devastating rate in order to supply the huge demand for this mulch, taking nearly 3 million more cubic feet of cypress than it replaces annually. (source = U of I Extension Service, taken from University of Florida data) So if environmental conservation is a part of your garden plan, you’ll want to carefully choose the type of mulch you use in your garden. Wondering which mulch will work in your garden design and how much it may cost? We believe you can’t go wrong layering mulch in your garden beds for all the reasons we’ve cited above. And while you can spend a fair amount of money on mulch, it is a very smart investment. If you have questions, we have answers and would be happy to talk with you about selection, purchase and installation of mulch in your personal landscape.